High-caliber newscasters are an interesting group. They inform, they teach and they persuade us. They use visuals in a way that complements what they are saying quite seamlessly. Their attire is impeccable, they look the part, and their delivery feels more like a conversation than a lecture. Somehow, they confidentially speak to an audience who can't talk back to them, and yet they manage to build a relationship with that audience. If you think about this description, it sounds a lot like a litigator. Of course, there are big differences between litigators and newscasters. Litigators don't simply read what is in front of them (at least not the good ones). Preparation for a newscast takes hours or days, not the months or years a trial might take. And of course, the skill set of a litigator is quite broad outside of the courtroom performance aspect of the job, typically requiring the ability to negotiate, write well, organize well, think on your feet, lead a team, sell and much more. Still, I believe there are some very useful lessons to be learned from watching how the news is put together. The Nightly News with Brian Williams is a good example of a high-quality newscast, and about 10 million people watch it every day. Whether the evening's anchor is Brian Williams, Lester Holt or Savannah Guthrie (she happens to be an attorney), the presentation is well-refined, the delivery is exceptional and overall, it serves as a good model for how to communicate in the courtroom. Let's look at 10 things that litigators, especially those who participate in jury trials, can learn from a high-quality news broadcast. 1) Newscasters never speak in jargon: The language used is comfortable and accessible to all audiences. Litigators must work hard on themselves and with experts to strip away as much jargon and tech-speak as possible in their presentations. 2) Newscasters look the part. Brian Williams has been named to Vanity Fair's fashion hall of fame for his consistent well-tailored looks that convey professionalism without distracting from the information presented. I know great litigators who use style consultants to help plan their courtroom attire. If you can't or don't want to do that, read up on what works well as far as attire goes. 3) The graphic presentation style is simple and clear. A newscast is short. To get a lot of information across quickly and clearly, useful visual aides are critical. 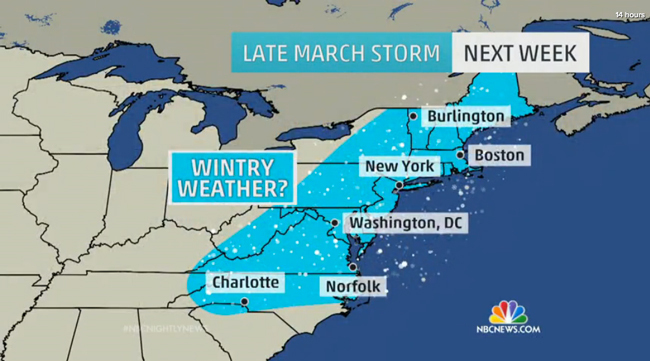 This chart below shown Wednesday night certainly gets the attention of those of us on the East Coast and quickly conveys information. It follows the simple rule of 'one concept, one slide' that we promote. 6. The presentation is not just informative. The presentation is entertaining as well. Brian Williams does a good job of appropriately injecting humor into his presentation. It makes him more credible and trustworthy. With that said, please remember that you never want to force courtroom humor and get a result like the one we discussed last June. 8. Attention is switched (intentionally) between spoken word and visuals. You must keep your audience on their toes. You must surprise them. Watch any Nightly News broadcast, and you'll see a combination of photos, graphics, video and talking heads used every time. The frequent switching of presentation methods keeps the viewer engaged. Try to match this style at an appropriate pace in the courtroom. 9. The nightly news is on every night. Until we can watch federal trials regularly, we have to learn from other sources like mock trials, state trials, televised appeals, CLE's, YouTube clips and the way they do things on the news. One of the great things about watching how they do things on the Nightly News is that it is on every day of the week, and they keep improving their approach. It is an easy and free place we courtroom experts can learn from. 10. Don't take yourself too seriously. Brian Williams is brilliantly funny, and it's his dry delivery that really sells his humor. He does not show too much of that on the Nightly News, but he shows just enough to forge a relationship with the audience. 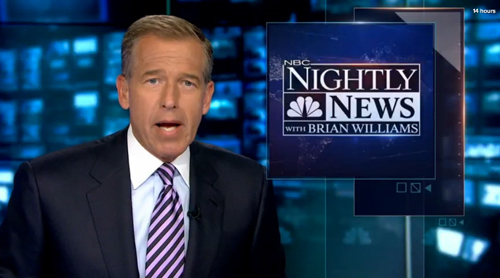 In this story, there is a two-and-a-half-minute video with some funny Brian Williams moments.